We’ve looked at a mountain of Mini-ITX kit so far this year, including a range of Mini-ITX motherboards and cases to house your small, but potentially mighty system. Hardware like Zotac’s Mini-ITX 9300 motherboard and Silverstone’s SG05 mean that a small system doesn’t have to mean small performance, but there’s still a problem standing in the way for many mini-ITX or HTPC owners – how to keep your kit cool in an environment where space is at a premium? Cooling your CPU in a full tower, or even mATX case is as easy as finding an after market cooler that fits your budget (and which received a positive review from bit-tech of course), but picking a cooler for a mini-ITX build is much more challenging. The height and size restrictions of much smaller cases means that efficient tower coolers, which use large stacks of cooling fins, are impossible to fit and the vast majority of coolers on the market are impractical, leaving users with a limited choice and the possibility compromising on either cooling or noise levels to keep their CPU cool. 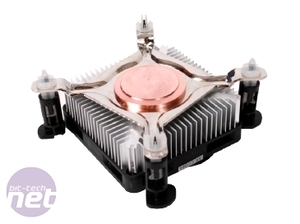 We think that’s a pretty raw deal, and having been frustrated ourselves in trying to find a capable low profile cooler set out to find a low profile cooler that would not only fit inside a restrictive mini-ITX case, but which could match or even better the cooling performance of Intel’s stock heatsink. We’ve assembled three such coolers which we hope might be up to the job, so let’s take a look. 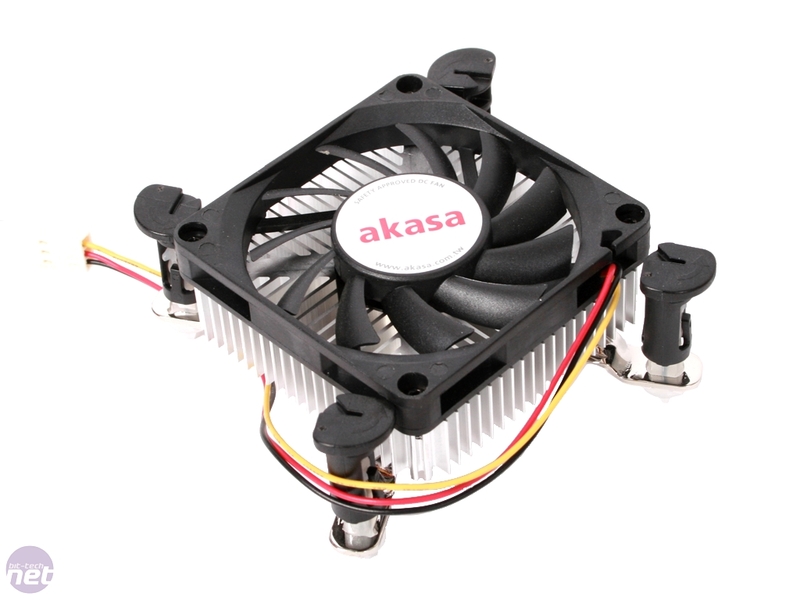 The Akasa AK-CC044 is one of the smallest low profile coolers we could find, and it really is absolutely tiny at just 3.1cm tall, with the cooling fins and fan combined not much taller than the standard LGA 775 push pins used to secure the cooler to your motherboard. Because of its diminutive size, the square aluminium block of cooling fins has been offset diagonally to fit within the standard LGA 775 mounting mechanism, but the cooler is so small that it’s sure to fit on absolutely any Intel LGA 775 motherboard. 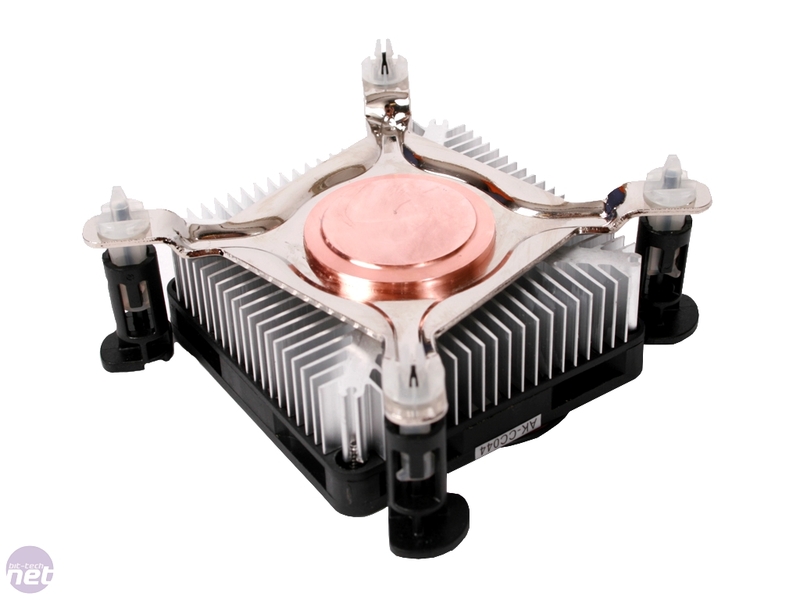 The cooler itself is similar to the Intel reference design, with a mirror finish copper base making contact with the CPU itself and then an aluminium heatsink mounted above to dissipate heat. Mounted on top of the block of aluminium is a low profile 70mm cooling fan blowing air down and through the cooler’s fins, although it’s a little disappointing to see that there’s no PWM connection, meaning the fan will run at its full speed of 2,800rpm constantly. As it’s basically the Intel reference cooler made twice as short, we’ve got some reservations about the Akasa already though, and it’s only this cooler’s bargain basement price that makes us hopeful that it could be a bang for buck winner. At just £7.72, it’s the cheapest low profile heatsink we could find able to cool 65W TDP processors like the Intel E5200.